According to American Eskimo Dog Guide, it is common for American Eskimo dogs to experience excessive scratching and irritation. As a result, they can get infections and skin problems such as hot spots, inflammation and hair loss. Treating skin problems with home remedies can help relieve common skin problems in American Eskimo dogs. Hair loss in American Eskimo dogs can lead to sunburn. 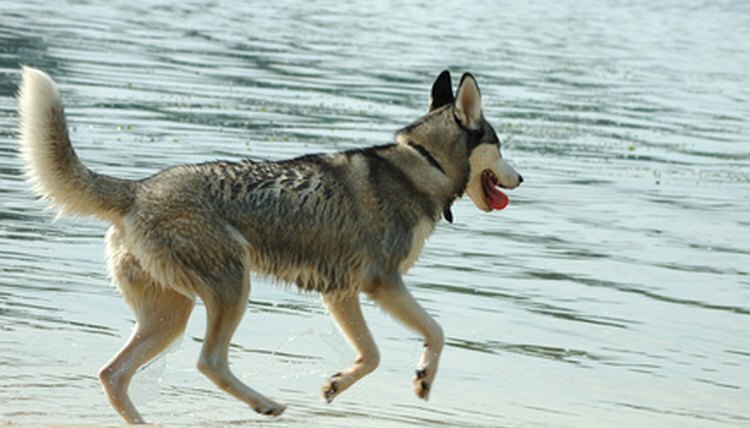 Dogs need their hair to maintain the body’s temperature, especially in cold weather. According to Easy Home Remedy, the herb goldenseal works well in treating hair loss. Apply directly onto the dog’s skin to cure hair loss and prevent it from happening again. Excessive itching may be caused by fleas. To soothe the dog’s skin, mix one tablespoon goldenseal extract, one to two ounces of jojoba oil and a couple drops of tea tree oil and extra virgin olive oil in a medium-size spray bottle. Fill the spray bottle the rest of the way with a half and half mixture of water and white vinegar. Spray the mixture onto the dog two times a week and massage onto the skin. Depending on the severity of the hot spots, you can apply the mixture up to two to four times a day. Canine Natural Cures recommends creating an herbal flea dip from rosemary to prevent fleas. Put two cups of rosemary into boiling water. Let it steep for around 30 minutes. Then, separate the leaves from the water using a strainer. Add about a gallon of warm water, enough to cover the dog’s skin. Pour the mixture over the dog and let it dry naturally. Earth Clinic states that every home with dogs should have apple cider vinegar. One of the many benefits it has for dogs is alleviating allergies. Pour apple cider vinegar in a spray bottle and spray on the dog’s skin. This helps relieve itchiness caused by allergies. If your American Eskimo has already developed hot spots due to excessive scratching, dilute the vinegar in water to lessen the strength and prevent it from burning his skin. Add two teaspoons of apple cider vinegar to the dog’s drinking water to help relieve other symptoms of allergies such as nasal discharge, coughs and runny eyes. A few drops of the vinegar into a dog’s ears also helps to relieve ear infections.